In the global theatre of contemporary warfare, courage and endurance are crucial for overcoming adversity. However, for Caroline Paige, a jet and helicopter navigator in the Royal Air Force, adversity was a common companion both on and off the field of battle. In 1999, Paige became the first ever openly serving transgender officer in the British military. Already a highly respected aviator, she rose against the extraordinary challenges placed before her to remain on the front line in the war on terror, serving a further sixteen years and flying battlefield helicopters in Bosnia, Iraq and Afghanistan. Detailing the emotional complexities of her transition, Paige reveals the external threats she faced in warzones around the world and the internal conflict she suffered while fighting prejudice at home. The result is a story of secrecy and vulnerability, of fear and courage, of challenge and hope. 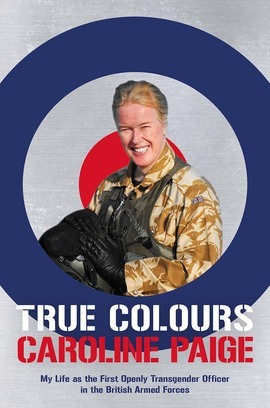 Criss-crossing battle lines both foreign and domestic, True Colours is the unflinchingly honest and inspirational account of one woman’s venerable military career and the monumental struggle she overcame while grappling with gender identity on the quest for acceptance.